Kolob Creek is a beautiful slot canyon in Zion National Park, however the canyon quickly gained a reputation as a "killer" in 1993 when two Boy Scout Leaders were killed during a descent. Be prepared to exert substantial energy to complete the canyon as a one day adventure. If the canyon conditions allow, the best time to do the hike is in early summer when the days are longer and ambient air temps are warmer. Average hiking time: 13 hours - Forced bivy's are not uncommon. Equipment: Preparation should include 2-200' ropes (deployment bags such as the Imlay Canyon Gear Rope Silos which are highly recommended), 30' of 1' tubular webbing, a full wetsuit (7mm highly recommended) or drysuit and proper insulative clothing for underneath, wetsuit hood or tight fitting synthetic took, helmet, neoprene or protective gloves, sticky, self draining footwear with neoprene socks, dry bags to protect camera equipment, dry clothing change, a rugged pack, water filter recommended, emergency bivouac gear (emergency bag, matches and fire starting materials). Harness and rappel device and backup ascending equipment, (purcell prusik system or the like), personal anchor system such as a daisy chain and be sure to make several family and or friends aware of your plans and expected finishing time and a time as to when emergency services should be called in the event you become overdue. Technical: Dozen rappels and downclimbing. If doing this canyon with over 3cfs of water expect water pounding your head while rappelling. Its strongly recommended no one does this canyon when its over 3cfs! Difficulty: Strenuous hiking, river hiking, rappelling into many long, cold pools of water. Downclimbing skills are needed. Tricky rope work requires strong rope skills. Permits: Yes, a permit is required. Check the weather report before hiking this trail. Do not hike if it looks like rain or if the water in Kolob Creek is over 3cfs. Trail access: Access to Lava Point can be deterred due to snow. Best season: mid-June to mid-September when the water and air are warmer. Never enter a technical canyon without the knowledge and skills needed to safely explore and return. Advanced rope skills are required to navigate through Kolob Canyon. Strong rappelling and downclimbing skills are a must. 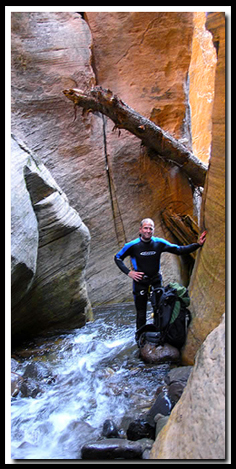 Remember slot canyons can change dramatically in a short time due to flash floods. These directions are only a general reference. Be prepared for variations in the canyon. Map reading skills are required. Off the beaten path: Yes, only 12 hikers are allowed in Kolob Canyon per day. Kolob Canyon, also called Kolob Creek, is a slot canyon. The area it's in is called Kolob Canyons, which is a section of Zion National Park. Trailhead - A car shuttle is not required for a one day hike, however excellent route finding skills are a must. Park at the gate or nearby the West Rim Trailhead. The West Rim Trailhead can be found by traveling just over 20 miles north on the Kolob Reservoir Road from the town of Virgin. There will be a sign on the right "Lava Point - West Rim Trailhead". Travel down the dirt road, just over 2 miles, to find the West Rim Trailhead. Park here. Begin the hike by walking back up the road in the direction that you just drove down. Notice the grassy small meadow where the road turns to the left, approximately 300 yards from the parking lot. Cross through the small meadow to the backside where the hill will drop off abruptly. Look carefully for remnants of an old logging road that traverses to the right and down. Follow this road as it switches back and heads to the left and winds through thick vegetation, and eventually comes alongside a drainage coming in from the left, draining to the east (Boundary Canyon). Cross to the north side of the drainage and scramble up the loose and densely vegetated hillside to gain a saddle that looks down and to the north into a large forested bowl. Work your way to the north and down and you will soon be walking in or on the side of another drainage. Try to get on the north side of the drainage. The drainage will deepen and there is a dryfall near the bottom of the drainage just before it confluences with Kolob Creek. At Kolob Creek work downstream the easiest way possible. After about 200 yards stay on the left side of the creek and you will come to a clearing and the large "waterfall grotto" will be to the right. First Rappel - This will be the entry and first rappel into Kolob Creek. There are webbing anchors on a pine tree in the watercourse at the waterfall, or you may opt to use the webbing anchors on the left side located on a horizontally growing tree. This drop is about 80' and allows entrance into the grotto before needing to wetsuit up. Once in the grotto the fun begins. Double check stream flow. If you can't hear each other from the thunder of the waterfall, then jug back up and plan another trip. If the conditions are safe then batten down the hatches, put on your wetsuit and enjoy the beautiful sculpting, many rappels (up to 170' and some with the cold water pounding on your head). Slot Section - Rope management becomes crucial during the descent. When possible set rappel length with a biner block to prevent stream-flow "rats nests" below. Always locate the next anchor opportunity before pulling the rope down since there may be "second drop" on the same rappel anchor. There should be about one dozen rappels during the course of the "fluted slot" section of Kolob Creek and next .5 miles of rappelling and swimming. The last rappel encountered in this section of canyon is the longest at about 165' and is spectacular. Once at the bottom of this rappel and you have swam around the corner to the beach, you have completed the the slot section of Kolob Creek. MIA Exit - It's now about 2 miles of "narrows" style hiking to reach the exit point. The route out is called the MIA exit, and it's very steep and requires several 4th class scrambling. Insure that you have planned ample time to locate the MIA exit and to climb out of it in case of problems. You may find a rock cairn at the exit point on your right as you hike down Kolob Creek but keep eyes peeled and don't count on the cairn. The exit will be the first place in the canyon that the hill side looks attainable. If you see a dryfall on your right after a wooded hillside (20 yards past) then you have passed the exit. The exit starts up the steep, wooded hillside just prior (upstream) from the dryfall. Scramble up the hillside on the faint impacted trail as it veers to the left at the base of the cliff. The trail ascends about 150' and then drops steeply into the wash that is at the top of the dryfall. Follow the wash up and be aware of any trails that will assist passing obstacles in the streambed. Soon the exit becomes an easy to navigate streambed floor. Continue up to some bouldery sections and then a dryfall, which is not up-climbable. Go back downstream about 75 yards and look to the right while walking back down the wash. Note a steep hillside that is worn from scrambling hikers. Go straight up this dirt - rock hillside, aiming for a large pine tree about 200' up. At this tree a faint traversing trail turns right and traverses the hillside above the wash and eventually puts you in the wash above the dryfall that was impassible. Continue up this wash and negotiate a couple of slotted dryfall's by using propped logs. Soon you will be walking up the wash and come to a split of drainage's and a cairn (maybe) on the hill on your left. Go left and scramble up another wash. Soon a ridge presents itself on the right. Pick the easiest route to the top of this ridge. Once on this ridge, continue always staying to the left and out of the forming Rock Bowl on your right. By staying left, the hillside will show obvious trails that will go to the rim several hundred feet above and arrive at the road. Lava Point - It is now an easy stroll on the road for 3 miles to arrive at the parking area. Once topped out on MIA and on the road, bear to the right and take the upper road at the "Y" 100 yards from the exit. This road will head Northwest and uphill for a while and then take a right at a hair-pin curve leading easterly for a while then hairpin and back to the west. Stay on the main road, pass through the closed gate and then its a couple more miles back to the West Rim Trailhead. Call the Washington County Water District at 435.673.3617 (open M-F 9-5) and find out the amount of water being released; If it is greater than 3 cfs, including the spillover, strongly consider doing another hike. 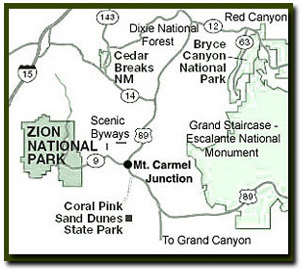 In addition, call the Zion Canyon Visitors Center for weather conditions prior to the hike: (435) 772-3256. Hiking in slot canyons presents a very real danger from flash flooding. Do not hike this trail if it is raining. Remember a storm far off can trigger a flash flood. Kolob Canyon has a moderate flash flood danger. Calculating water flow - The water flowing through Kolob Creek is due to released waters from the Kolob Reservoir, located at the head of Kolob Creek. The flow fluctuates depending on the release schedule. Contact the Washington County Water Conservancy District at 435-673-3617 and ask how much water is being released during the time of your planned trip through Kolob Creek. For an experienced slot canyon hiker, 3 cubic feet per second would be optimal and any more than 3cfs release could present very real dangers. After high snow pack winters, there may be additional water spilling over the dam above and beyond the amount specified as being released by Washington County Water Conservancy District and this could be make a 3cfs release deadly to even a seasoned slot canyon hiker. Drive up the road where Kolob Creek passes under the road and if there is much more than a trickle to turn back and do it another day. In addition when arriving at the first rappel, if the stream is flowing more than ankle deep at the bottom, then waylay your trip for another day. A permit must be secured for a planned trip thru Kolob Creek by requesting it at the Zion National Park Backcountry Desk. 1-435-772-0170 for information.